All students are encouraged to attend and learn more about this dynamic organization! All DECA Business Club Scholarship recipients must attend this meeting! Did you know that if you receive a BPA, FBLA, or VEI Business Club Scholarship that you can join DECA and fulfill your scholarship requirements? 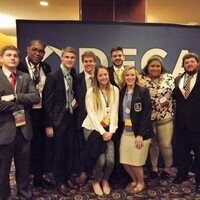 NU DECA has the largest Collegiate DECA Chapter in the State of Michigan! NU DECA excels at both State and International Competition!